The Universal Monsters have always to me been one of the poster children of cinema. Dracula, Frankenstein, The Wolf Man, and of course The Mummy filled my nights with terrors as a kid. While the first few have been updated for the current times quite often, The Mummy always seemed to be dragging its foot to that party. That changed when Stephen Sommers decided to mix The Mummy with Indiana Jones and the rest as you say is history. Reworking a classic can be a tough task; one that Sommers was more than up for. Gone were the bandages and the chasing people at a crawl. In return we got a vengeful mummy, one who wants to bring the love of his life back and the ten plagues of Egypt with him. There are only three people who can stop him, a mercenary, a librarian and her brother. In the CG age as we look back at the early effects we can see them not hold up as well. Sure it was cool then, but when you look at what is being produced now, some of them are pretty plain. The year 1999 was a big step forward and this movie benefitted from that as the look holds up all these years later. While the look in important, it isn’t what makes this movie stand the test of time that would be the story. Mixing Indiana Jones adventure with a Universal Monster is really a match made in heaven and has one of those “why didn’t I think of that “ feels to it. With the right story it then comes to casting the right actors and Sommers nailed that as well. You can argue Brandon Fraser has never been better with a role he appears meant to play and add the always-great Rachel Weisz and you are set. For me my Mummy is not some guy who grunts as he chases you, for me he is a guy who takes what he needs from his victims to be whole again. Eyes, tongue, what have you, I love this movie and time has not done anything to lessen this love. With a recent watch it reminded me where I think they went right, instead of trying to instill fear in you, they just wanted to entertain you. With the upcoming “The Mummy” with Tom Cruise that is launching the “Dark Universe” for Universal in which we will see the return of their classic monsters it is good to look back. 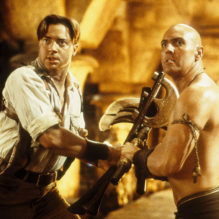 We can do that fondly with a lot of movies done right, but for me not many did it much better than 1999’s “The Mummy”.